By popular demand, the water used in Windward is now available as a stand-alone package. Normal Map has the normal map's XYZ in RGB channels and the foam texture in the alpha channel. Reflection texture is created automatically, and is used in medium quality water and higher. 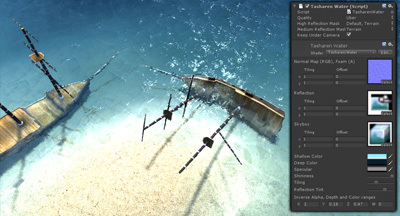 Skybox is used to "fake" reflection, and is used in low quality water. Shallow Color controls the color of the water considered to be "shallow". Deep Color controls the color of the water where the water is as deep as it can get. Specular color controls the strength of the specular highlights. Shininess controls how shiny your water is going to be. Tiling controls the tiling of the normal map's texture. Reflection Tint controls how bright the reflection is going to be. Inverse Alpha, Depth and Color ranges control the foam and depth of the water. Quality controls the quality of the water. The lower the quality, the higher the performance. High Reflection Mask controls what will be reflected at High and Uber quality levels. 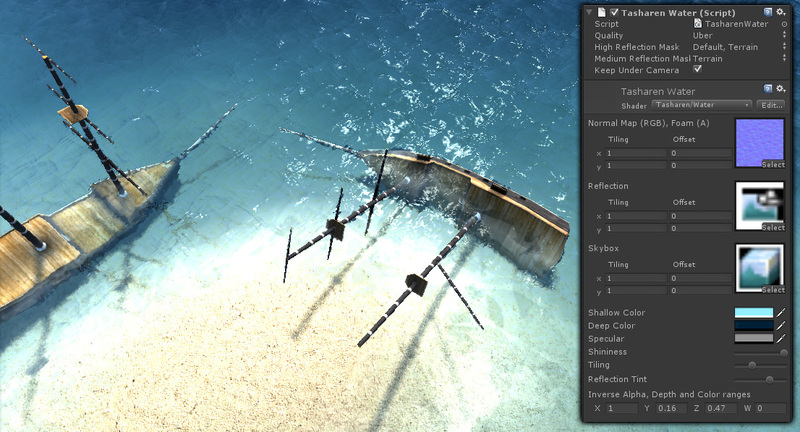 Medium Reflection Mask controls what will be reflected at the Medium quality level. Keep Under Camera option will keep the water underneath the camera at all times. This is useful if you don't want to place the water manually. It will always travel with the main camera (and thus -- the player), remaining at the height of 0. Hi, I just purchased this and have a problem with the water shader. It says in the Inspector that the shader has errors or is not supported by my graphics card. So my water is bright pink in the demo. I have a new Windows laptop with a pretty good graphics card. What might correct this? Is that water shader the Shader Number 3 that's required? Or is that something else? Curious. Did you try the demo first? Does it run well for you, or do you also see pink? That was the demo I was using. Let me try it again and put up a screenshot if it doesn't look right. Is the Tasharen Water Shader the Shader Number 3? I must be missing something---this is the Water Demo scene. I have Unity Basic--does it require Pro? I just updated my version of Unity to the latest version today. Medium quality levels and higher require pro, lowest may work on Free, but it has not been confirmed. I am not certain if depth texture is accessible in the free version of Unity -- perhaps it isn't? Sounds like I need to create another fallback level to make it work on Unity Free then. Grab the latest version. I added support for Unity free. The update hasn't hit yet but I'm sure it will. Hasn't it? Hmm. Version 1.2 is visible to me. P.S. While it works now, it won't look as good. One important feature (depth texture support) is not available to Unity free. I have an error still---not enough temporary registers needs 9. Is there something I can do? I'm still pink. No, just pc and running the demo scene.